North Vancouver, B.C., November 30, 2017. 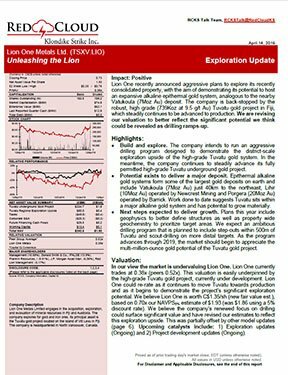 Lion One Metals Limited (TSX-V: LIO) (ASX: LLO) (OTCQX: LOMLF) (FSX: LY1) (the “Company”) is pleased to announce that following the recently announced award of the Navilawa Special Prospecting Licence (SPL 1412) it has completed a first-pass compilation of data over the Banana Creek Target adjoining the Company’s fully permitted high grade underground Tuvatu Gold Project located on the island of Viti Levu in the Republic of Fiji. 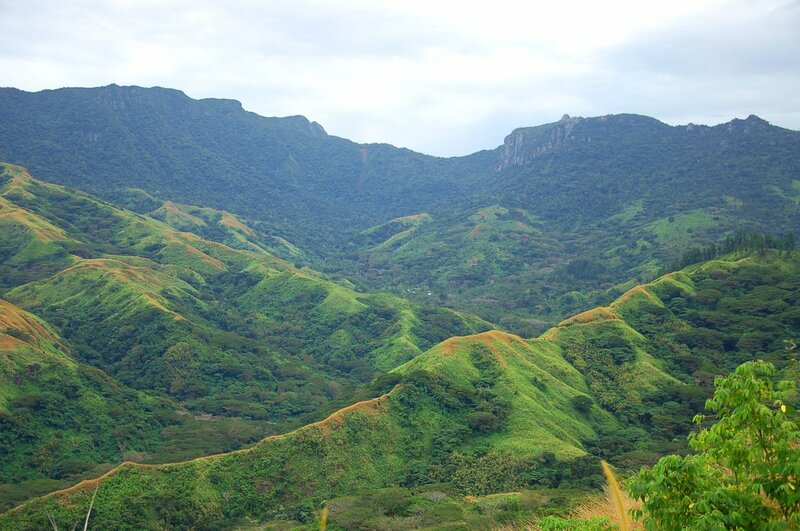 The samples in this press-release are compiled from reports and data provided by the Fiji Government Mineral Resources Department and contain information reported by previous explorers in the area. Whilst every effort has been made to review historic reports and check the data, the samples were collected by previous explorers and cannot be fully verified. Company geologists have visited the project and reported lode style of mineralisation visually similar to Tuvatu, however, the original sample security, laboratory, and assay method cannot be fully verified by the Qualified Person / Competent Person other than disclosure taken from previous company reports. These results are hence considered ‘historic’ and are presented as a guideline only. As a result, the assays reported in this release are not to be considered necessarily representative of the overall system. The Company intends to collect new data in this area, and all historic results will not be used in mineral resource estimation or economic decisions other than to advance exploration. Refer to Appendix 1 for further details. 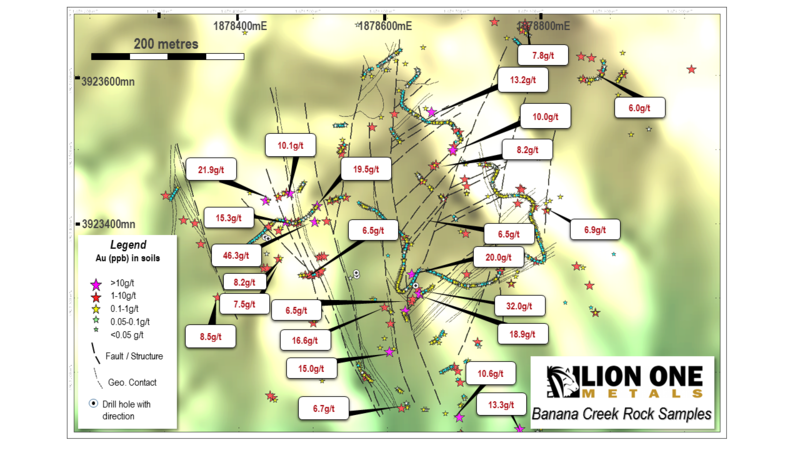 Banana Creek as a clear focus with several mineralised structures potentially capable of complimenting and enhancing production scenarios at the Tuvatu Gold Project. Data has been compiled from reports and databases from previous explorers lodged with the Mineral Resources Department of the Fiji Government. This data is historic, and in many cases the assay or sample method, laboratory or detection limits are not recorded. And as a result, the Company uses these data cautiously and as a guideline. All data is compiled on a best-efforts basis but certain errors may exist and therefore are to be considered as a guideline only. More than 500 soil samples have been collected by previous explorers in the Banana Creek area. This work is principally ridge and spur soil sampling. The soil sampling indicates a gold in soil anomaly of >100ppb gold (0.1ppm / 0.1g/t) over an area greater than 500 metres by 750 metres (Figure 1). Figure 1: Gold in Soil sampling at the Banana Creek Target (background = shaded terrain model). More than 800 rock samples have been collected in the Banana Creek area and are a combination of channel sampling, float (loose material at surface) and rock-chips. Of these 114 samples were greater than 1g/t gold with a peak value of 46.3g/t gold (Figure 2). Previous drilling at Banana Creek consists of 5 diamond core holes with a total of 531 metres drilling (average depth = 104 metres). Three of these holes (BCDH001, 002, 003) were drilled away from or parallel to the main structural trends and as a result did not intersect appreciable mineralisation. 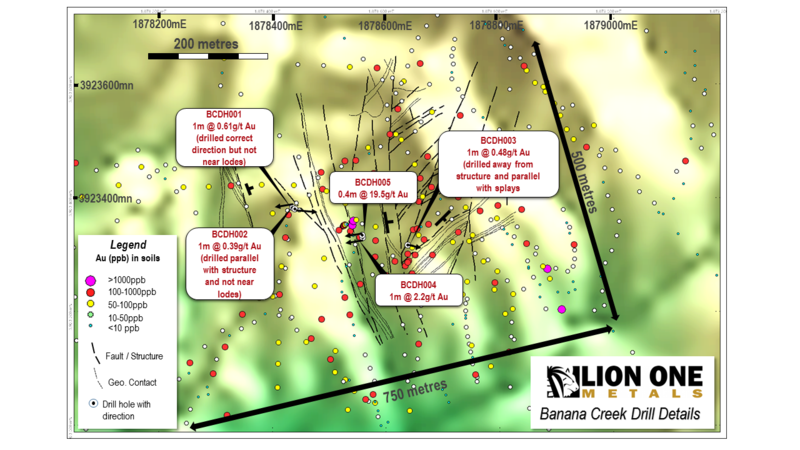 Holes BCDH004 and 005 respectively were drilled in the central portion of the Banana Creek Taregt and intersected peak values of 19.5g/t gold and 2.2g/t gold respectively (Figure 3). The Banana Creek Target consists of altered Navilawa monzonite intrusive flanked by Nadele volcanic breccia and intruded by micromonzonite dykes. The mineralisation has been mapped at surface on lodes that strike NNW-SSE and cross-structures NE-SW. Previous Fiji Government airborne surveys indicate that the Banana Creek Target has an elevated potassium signature in radiometrics indicating a zone of hydrothermal alteration approximately 1.6 kilometres by 600 metres and is comparable to the anomaly at the Tuvatu Gold Project (Figure 4). With both gold and base-metal anomalism, the mineralisation may be of a style comparable to the HT Corridor mineralisation at Tuvatu previously announced by the Company. Figure 4: Government airborne potassium radiometric image. Hot colours red->purple->white indicate increasing potassium and is an indication of increasing hydrothermal alteration. 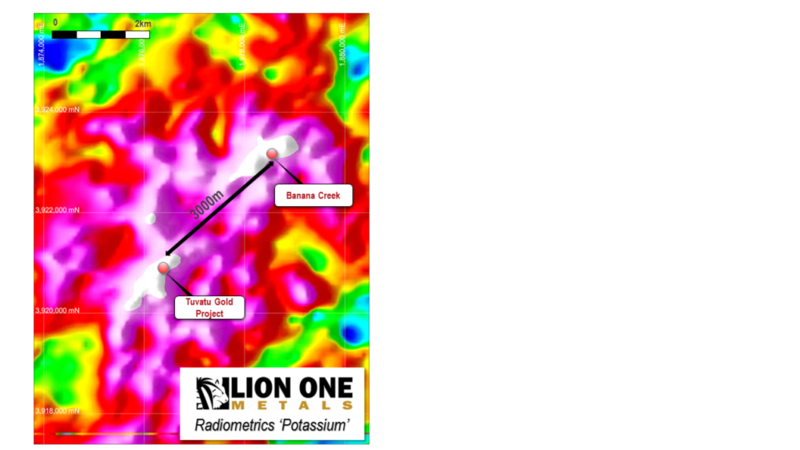 Lion One is advancing its 100% owned Tuvatu Gold Project as a world class discovery and near-term production opportunity in the southwest Pacific Ring of Fire. 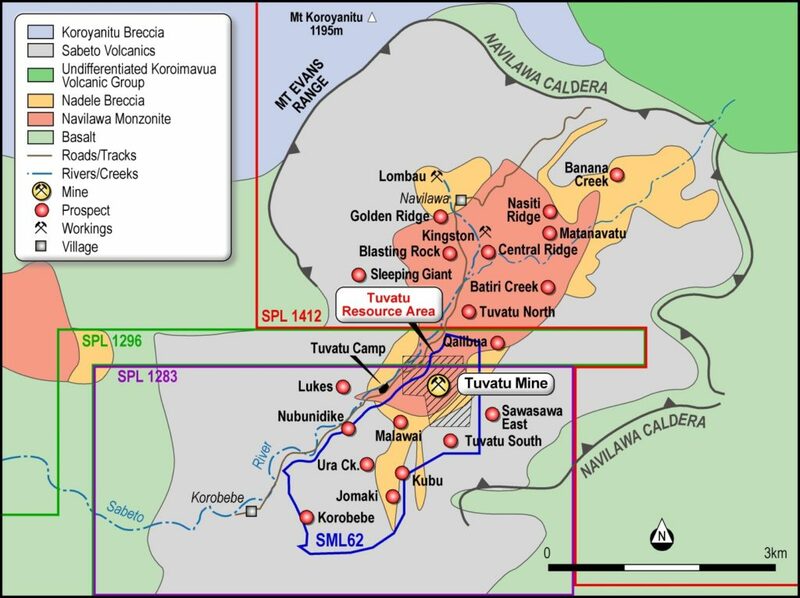 Tuvatu is modelled for exploration after regional giants in the low sulphidation family of high grade epithermal gold deposits such as Porgera and Lihir in PNG, and Vatukoula in Fiji. These spectacular discoveries have produced over 35 million ounces of gold in similar alkaline volcanic settings. Tuvatu has been fully permitted by the Government of Fiji for operations start-up and has a dual-track strategy of production development and resource expansion inside its 385 hectare mining lease. Tuvatu is located 17 km from the international airport in Nadi, on the west coast of Viti Levu in the Republic of Fiji. Lion One’s CEO Walter Berukoff is leading an experienced team of mine builders, and has owned or operated over 20 mines in 7 countries. As the founder and former CEO of Miramar Mines, Northern Orion, and La Mancha Resources, Walter is credited with building over $3 billion of value for shareholders. Tuvatu was advanced by previous owners through underground exploration and development from 1997 through to the completion of a feasibility study in 2000. Acquired by Lion One in 2011, the project has over 110,000 meters of drilling completed to date in addition to 1,430 meters of underground development. Stephen Mann, Managing Director, member of The Australasian Institute of Mining and Metallurgy, is the Qualified Person (“QP”) responsible for the Tuvatu Mine exploration and delineation programs. Table A1.1. Past ownership, report sources and sample details. Reported by Alcaston in 2003 annual report and compiled in databases from Golden Rim mining (2010). 5 diamond drill holes, HQ size core. Soil sampling using 50mm Augur Samples. ‘C’ Horizon Soil. Radiometrics / magnetics 2007 ALS Chemex Laboratory in Brisbane. Special Prospecting Licence 1412: Annual Reports 2008, 2009, 2010 (3 reports) Rock chips (2008) Not disclosed in reports but assumed equivalent to above 2003-2007 annual reports. Table A1.2 Banana Creek Rock Sampling Data > 1g/t, sorted by gold grade from various reports as compiled by Alcaston Mining and Golden Rim Mining noted anbove. Sample Type: Rock = rock sample collected in outcrop; Channel = channel sample collected in outcrop or trench; Rock unclassified = rock sample with unknown sampling technique. Bd = below detection; “-“ = not assayed. Highest samples per assay result highlighted in bold. Coordinates in Fiji Map Grid (Vitu Levu). All samples are considered ‘selective’ in that they were selected by geologist or field technician from specific mineralised lodes reported between 0.1 and 2 metres wide and may not be representative of the overall system.